See you later. Senator Warren announced she’s entering theresidential race and that announcement received a quick response from president trump. ABC’s white house correspondent Ta Palmeri is at the white house with the campaign launch, the response and the backlash. 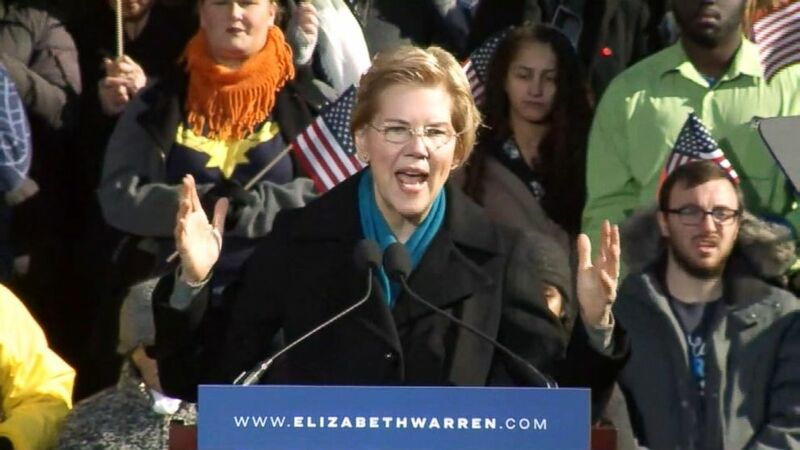 We need to take power in Washington away from the wealthy and well-connected and put it back in the hands of the people where it belongs Reporter: In the bitter cold, senator Elizabeth Warren officially announcing her candidacy for president in front of more than 3,000 people. The senator laying out her plan for 2020 with a promise to fight against income inequality. This is the fight of our lives. The fight to build an America that works for everyone. Reporter: The announcement for the presidential hopeful comes as she looks back at backlash over her native American ancestry. Just last week, “The Washington post” obtained her 1986 bar registration card where under race she called herself American Indian, a claim she has made for almost two decades, but Warren issued a private apology to the chief of the cherokee nation and said this on capitol hill. It was based on my understanding from my family’s stories, but family stories are not the same as tribal citizenship. Reporter: President trump has repeatedly referred to Warren with racial slurs, taunting the setor on several occasions to prove her heritage. Tweeting late last night, will she run as our first native American presidential candidate or has she decided that after 32 years, this is not playing so well anymore? See you on the campaign trail, Liz. Warren isn’t the only senate Democrat to throw her hat into the ring. Senator Cory booker of new Jersey spent the week crisscrossing Iowa, and senator Amy klobuchar is expected to announce her candidacy today. Dan and Eva? It is busy. Thank you very much. February 16, 2019 Comments Off on Women Often Can’t Afford Tampons, Pads In Federal Prisons. That’s About To Change.